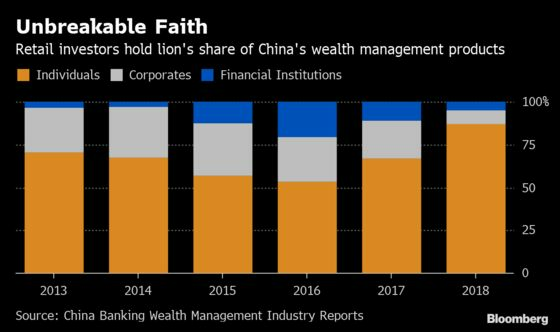 (Bloomberg) -- China’s savers are turning a deaf ear to government warnings about one of their favorite investments. Individuals hold nearly 90 percent of instruments known as wealth management products, a record share, because many believe they’re shielded from losses -- a view officials have tried hard to discourage. The assumption of safety has been buttressed by the fact that the large banks that issue WMPs have at times dipped into their own balance sheets to protect investors from losses or even outright defaults. WMPs are issued by banks and typically offer yields of 3 percent to 5 percent, more than double that of one-year bank deposits. They can invest in anything from bonds and stocks to property. Rules published in April 2018 capped leverage and banned banks from guaranteeing returns. Regulators also urged the public to report cases where products were marketed with implicit guarantees. 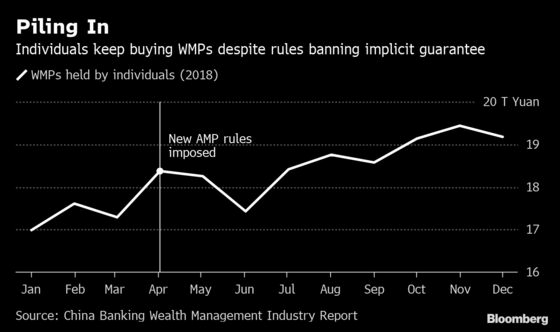 While issuers have until 2020 to comply with the new rules, some banks have started to market their WMPs based on fluctuations in their net asset value -- a better indicator of risk -- rather than an expected rate of return that can be interpreted as an implicit guarantee. Previously, when WMPs failed to meet advertised yields, banks would bridge the shortfall themselves rather than risk a hit to their reputation. Even after the changes, savers’ perception of an implicit backstop may linger, in part because defaults are almost unheard of. Spurred by the rule changes, banks are spinning off their wealth management units, a shift that should insulate their mainstay operations from any risks. Having a separate unit, rather than a consumer bank brand, offering the products could also help make it clear that investors can’t rely on being rescued from losses.